Summerfield. Kansas is an historical border town on the Kansas/Nebraska line in Marshall County. 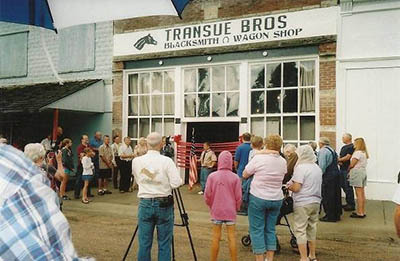 A little over 50 families call the town home and are especially proud to host the annual Pioneer Days Festival that draws visitors to the Transue Brothers Museum with history and demonstrations of blacksmithing and other pioneer activities. The town started just prior to 1889 with almost a hundred tents set up south and east of town where the men were surveying for the railroad, and then they started building the right-of-way and laying railroad track for the new railroad that was to join the St. Joseph and Grand Island to the Burlington railroad. During the year of 1888, the Kansas City Wyandotte and Northwestern Railroad came through. Later this track of rail became the Missouri Pacific System. The railroad companies were engaged in surveying a route for a proposed line from Kansas City to Beatrice, Nebraska.